Hunt was looking to create a more engaging Facebook experience and get their fans involved in their latest promotional event. Create a customized Photo Contest on Facebook using Vionic’s Deal Maker Pro. How Did Hunt Do It? Hunt is a modeling and advertising agency, offering services for brands, products, and events. They are committed to offering exceptional full-service marketing, from custom designed, high quality branding materials to model hosts. Hunt was looking to create a more engaging Facebook experience and get their fans involved in their latest promotional event with Sugar Bikini Co.
Hunt created a jaw-dropping Photo Contest campaign using Vionic’s Deal Maker Pro application. Hunt worked with Sugar Bikini Co. to put on a Bikini Catwalk at Palmera Beach Fest in Acapulco, Mexico. The Photo Contest offered fans the opportunity to see their favorite models on stage! Hunt uploaded photos of 13 models. The top 7 models with the highest number of votes were selected to model Sugar Bikini Co.’s swimwear on the catwalk at Palmera Beach Fest on December 27, 2014. After 18 days, Hunt brought heavy traffic to their Facebook photo contest, accumulating 4,666 votes using Vionic’s Deal Maker Pro! 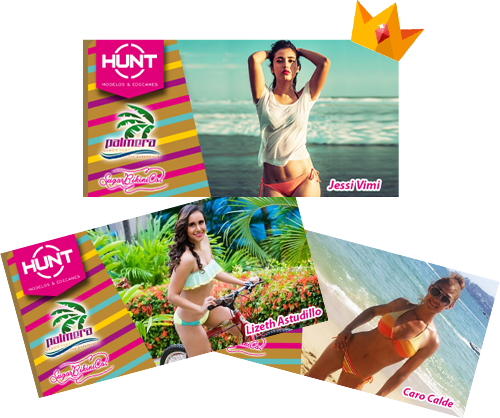 Hunt model “Jess Vimi” with 950 votes, followed by “Lizeth Astudillo” with 916 votes and “Caro Calde” with 785 votes!